By now the fatal police shooting of Jean Charles de Menezes in the wake of the London bombings is already beginning to fade from the news. See the Wikipedia for a good collection of details and articles about the case. Basically, Mr. Menezes was a 27-year-old electrician from Brazil, a legal immigrant who had the misfortune to be living in the same block of flats as suspected bombers. When he left for work on the morning of July 22, he was followed by a large group of police who were suspicious of his warm clothing (and of course, his brown skin). They let him get on a bus, but when he got to the Stockwell subway station, they began chasing him with guns (remember, they were in plainclothes). A terrified Mr. Menezes (who by some accounts had been assaulted by a gang a few weeks before) ran into the station and tried to get on a train, but several police pushed him to the floor of the subway car and another shot him seven times in the head and once in the shoulder, as horrified passengers looked on. Politicians and police officials have expressed cursory regrets, but say the "shoot to kill" policy will continue. It was his fault for running from police (who were dressed in plain clothes and may not even have identified themselves, depending on conflicting reports). Anyone who runs from police is obviously guilty and deserves to be shot. Our sympathy needs to be with those courageous police, it's so hard to be a police officer that anything they do is justifiable. (i.e. I'm not brown so I'm not scared of the police). It was the TERRORISTS who killed Menezes, by forcing the police to do what they did. (Right, just like the TERRORISTS bombed Baghdad, right? Terrorism absolves us of all responsibility for our actions!) In other words, some innocent people have to die to protect other, more important (and perhaps more "photogenic") innocent people! That pretty much sums it up. 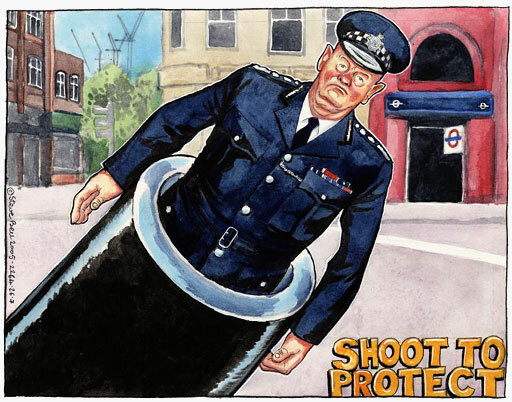 Anyway, I haven't seen a whole lot of bloggers commenting on this, but IndyMedia UK has a collection of great imaginary media talking points about the shooting (it's worth noting here that the policy is being referred to in the media as "shoot to kill to protect", as if anyone was "protected" by the murder of an innocent man). There's some pieces on the Huffington Post by Hooman Majd and Richard Bradley. The blog Sporula has a good piece called "The London Shooting and the Myth of Race". And Earl Ofari Hutchinson has an excellent piece on what this says about racial profiling in Britain in general. And there was a post in a Daily Kos diary Monday with some discussion. Today's (7/28) NY Times has a guest op-ed defending the killing of Mr. Menezes, "When You Have to Shoot First," similar to a recent NY Post editorial. The writer makes the same tired "the police had no choice because he was wearing a long warm coat on a hot summer day" argument (as if poor choice of dress justifies murder when they had no other evidence), and actually compares Mr. Menezes to a group of men who shot at a friend of his (nevermind that Mr. Menezes was unarmed). I can't tell you how glad I am to know that other people are upset about this. I wish the upset would bring him back for his poor family, but at least, this way, he'll be remembered as he should be. So the suggestion is to SHOOT the cannon (i.e. fire Sir Ian) TO PROTECT (the innocent civilians)"
The facts of the case are not clear to me, and I haven’t done the reading. But I’ll pose a contrary question for discussion: is there any possibility that more aggressive (read: risky/dangerous) law enforcement actually IS justifiable? If there are bombers (and there are), and we want to stop them from blowing people up (and we do), is it possible that it might actually be a good idea to use more force than would otherwise be acceptable? Perhaps not. Perhaps the price is too high. I’m just saying the answer isn’t obvious to me. Bombers in subways present a society with a very difficult problem! I linked to your post from my blog, and the trolls went absolutely bugfuck crazy! Paul: Yes, bombers in the subway do present a difficult problem. But we want to protect innocent people, not kill them. All that has been accomplished is the brutal murder of an innocent man whose behavior was not even particularly strange or unusual--no one has been protected, and shootings like these will do nothing but make minority communities distrustful of police and officials and less willing to work with them.